After nearly a decade of working to fulfill a vision of a Clear Lake public green space to alleviate flooding, foster nature conservation, clean run-off water and provide recreation opportunities, the Clear Lake City Water Authority has signed a Conservation Easement agreement with the Galveston Bay Foundation to conserve and protect the nearly 200 acres of the Exploration Green from commercial development in perpetuity. That means forever. Working with Keep Green Spaces Green grassroots efforts, through it all, the CLCWA leadership has supported the interests of residents, worked with grassroots neighborhood groups and actively opposed proposals to build highly concentrated residential condos behind the homes ringing the old Clear Lake City golf course. While some politicians and developers fought in court and even at the state house to open the area for commercial development, the CLCWA board kept their eyes on the prize no matter what obstacles were laid down in front of the initiative. 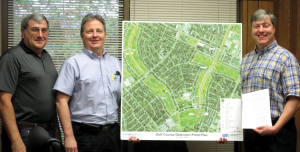 In 2005 Clear Lake residents discovered the plans to turn the golf course into a massive commercial development. The people rose up and engaged, some 4,000 signed a petition against the commercial development, and “Keep Green Spaces Green” signs were everywhere. Organizations such as the Clear Lake Civic League and Clear Lake City Green Space Preservation Committee focused the grass roots organizing while CLCWA fought in court to condemn the property with the water authority arguing that more storm water detention was required. “Today we thank all those who worked to make to control flooding and make “green space green” in Clear Lake,” a spokesman said. Working with the CLCWA today is a new non-profit organization, Exploration Green Conservancy, established to organize and create those parts of Exploration Green that are not flood control. With a board of local volunteers, the conservancy, like earlier town hall meetings and volunteer committees, provides an avenue for local residents to participate in planning, organizing, working with trees, trails and other projects, and maintaining the Green Space. Other partners in addition to Galveston Bay Foundation include Trees For Houston, Texas Coastal Watershed Program, SWA Architecture and Lockwood, Andrews and Newnam; all key to the success of Exploration Green. The Clear Lake City Water Authority brought them together to create Clear Lake’s Exploration Green. “In my 25 years of non-profit work, rarely if ever, have I seen an agency work so diligently on a challenging public project. This is a prime example of the true functions of this type of agency: increasing effectiveness while reducing long-term costs with the added benefit of recreational and environmental sustainability,” said Barry Ward, executive director of Trees For Houston. See the Galveston Bay Foundation website recognizing the historic conservation agreement between GBF and CLCWA at http://galvbay.org/news/explorationgreen/. GBF notes that both Exploration Green and the Clear Lake City Water Authority were awarded the 2013 Planning Award by the Houston-Galveston Area Council this past January. The HGAC ranked the conservation project at the top of nine public space development plans in the Houston region. In celebration of the conservation agreement, the partner organizations recommend that residents throughout the Bay Area visit Exploration Green and explore the entire area. It is easily found by doing a Google Map search for the local zip code, 77062, and looking for the V-shaped property near the Clear Lake Recreation Center.